This is a critical process for you to serve superb ramen noodles. Cooking noodles properly is very important, and it could ruin your noodles if done in a wrong way no matter how well you’ve made them. First of all, the most important thing in cooking of noodle is water. The type of water we want to use in cooking of noodles is soft water. What’s soft water or hard water? 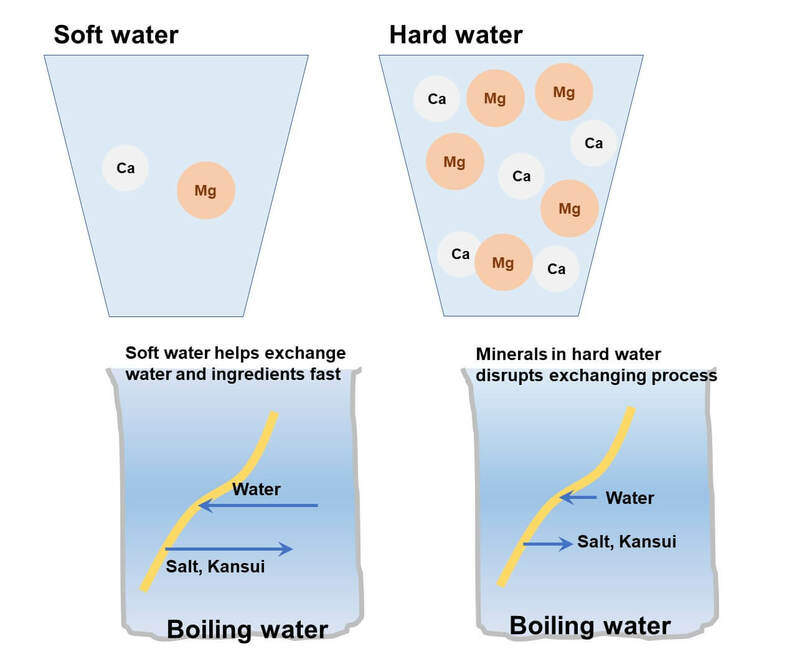 Soft water is water that has no or little minerals, such as calcium, magnesium, etc. Hard water is the opposite and with a lot of minerals in it. When we cook noodles in hard water, it is difficult for cooking water to penetrate into noodles, then cooking time prolongs, and cooked noodles turn soft fast in hot soup. Also, long cooking time means, bad yield (noodles melt into cooking water), rough noodle surface, and big difference in noodle condition between the core and surface, resulting in poor noodle texture. But, if we use soft water for cooking water, we can take advantage of osmotic pressure stronger than hard water and reduce cooking time. Additionally, we should also check the pH level of cooking water, which affects the quality of noodles boiled. 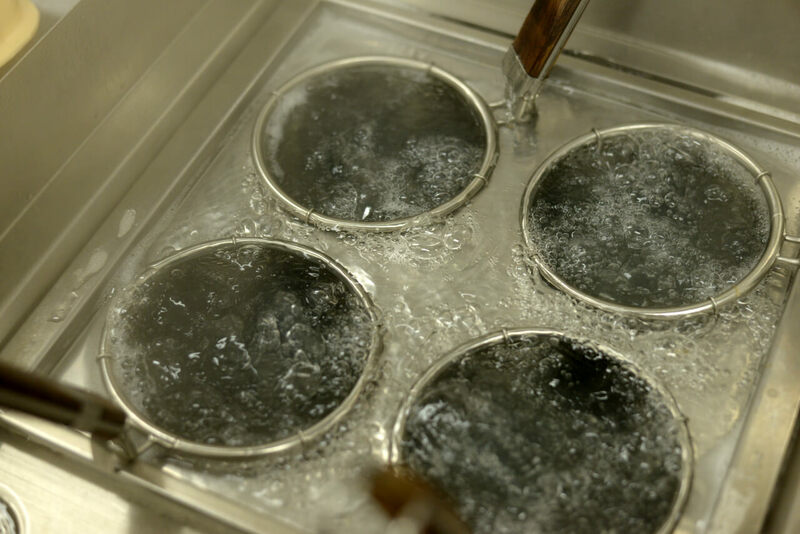 We did some tests in the past, comparing how much of the noodles cooked are melted into cooking water when boiling noodles at different pH levels. Let’s look at this chart here. 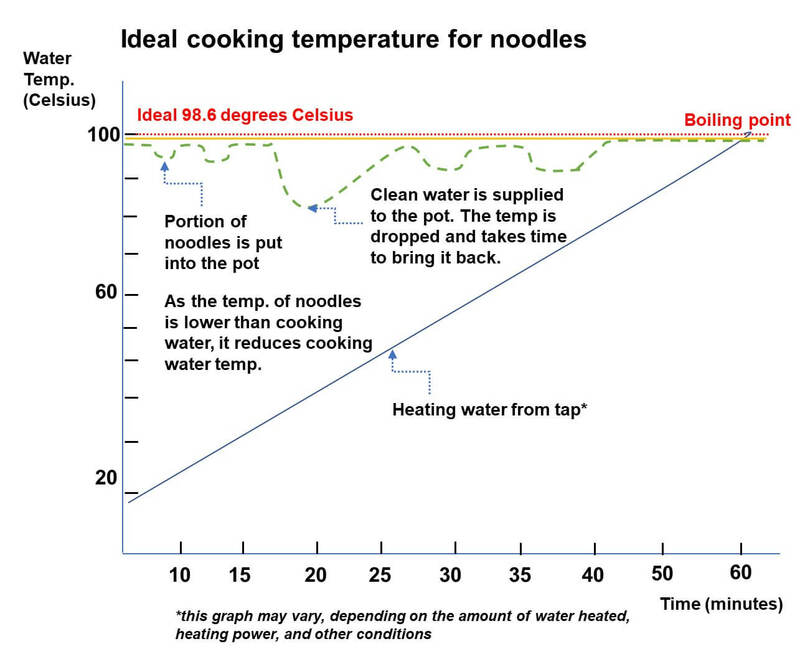 The figure on the right shows the pH level of cooking water and % of noodles melted into cooking water. 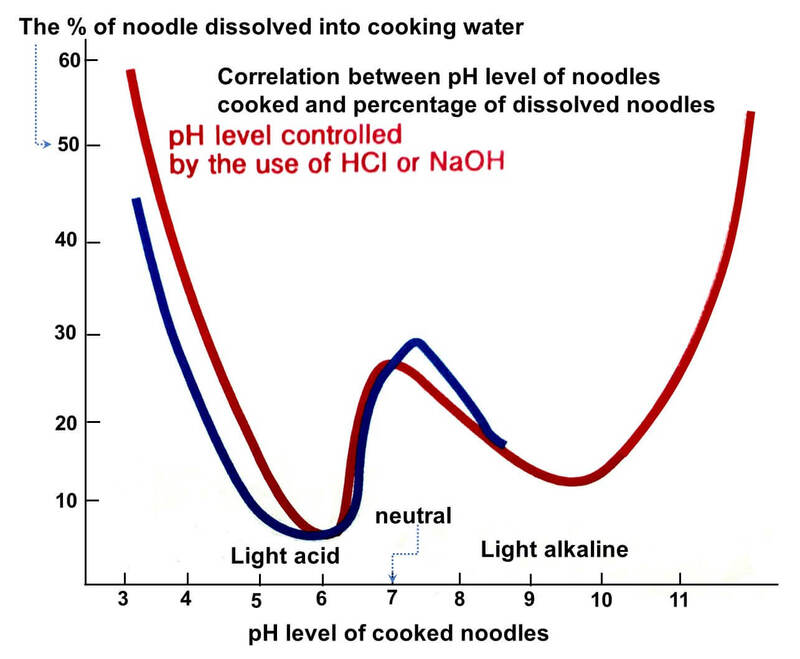 We found out that a lot of noodles melt at pH level of 7, which is Neutral, but when cooking water is pH level of light alkaline (pH9-10), we lose less noodles in boiling. And, we found that kansui used in ramen noodles, which makes cooking water lightly alkaline prevents noodles from dissolving into cooking water. However, as we cook more portions of ramen noodles over time, pH level of cooking water increases or comes more alkaline, we lose more noodles melted into cooking water. So, we need to change cooking water at certain point to clean water to maintain effective cooking of noodles. Okay. So, we now know the water should be soft and lightly alkaline to effectively and efficiently cook noodles. But, how do we actually cook noodles? I share in the following how to cook noodles, step by step. For some of you, this may be a common sense, but believe me. I’ve come across a lot of people, even professional chefs who do not know how to cook noodles properly. Also, cooking water becomes cloudy (with kansui released into cooking water) fast just after cooking a few portions of noodles. So, having a large amount of cooking water is critical. First, we should put a portion of noodles into water rolling boiling and quickly stir noodles with chopsticks to keep them from solidifying. If we just put noodles in and do nothing, noodles strands tend to get stuck together, it becomes hard to convey heat evenly throughout noodles. After the boiling comes back, lower the heat by a little bit because if we continue to keep the state of rolling boiling, noodles hit each other, and it may result in rough surfaces of noodle. When we take noodles out in a noodle basket, we should strain as much cooking water off noodles as possible because cooking water remaining on noodles dilute your soup. I know that you may want to add water to maintain or improve the condition of cooking water (as it gets cloudy with more kansui from cooked noodles over time), but please don’t. 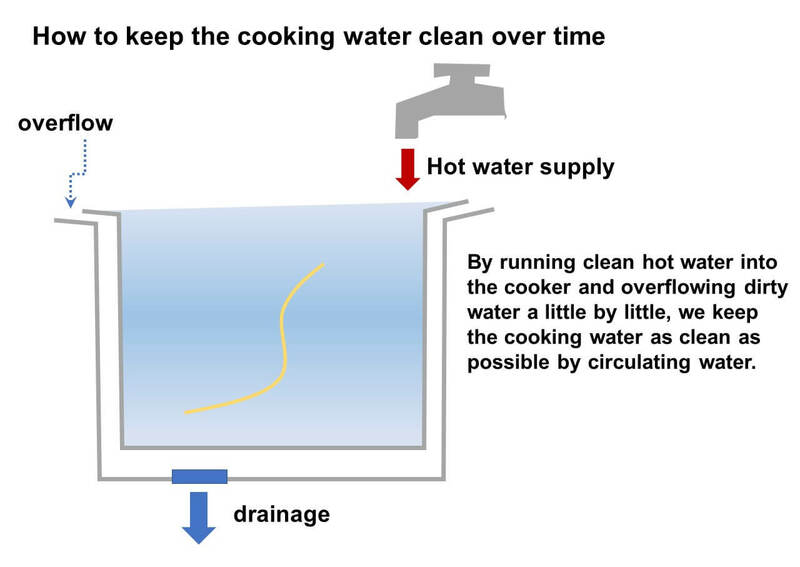 Other way we can improve the condition of cooking water is to keep hot water run into cooking water a bit by bit and the cooking water overflowing to circulate cooking water to maintain the condition of cooking water. And, when there’s a break, change the entire cooking water. 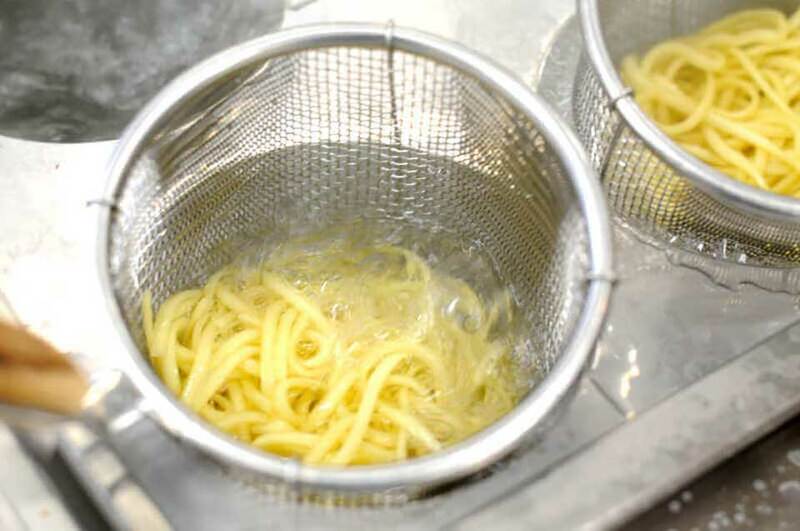 Because it takes time to bring water to the state of rolling boiling, it is necessary to think about how to handle cooking of noodles at your restaurant in advance. And, do you know how long you should cook your noodles? We know that proper cooking time varies for different sizes and water ratio of noodles. The table below summarizes the relationship between water ratios of noodles, noodle size, and cooking time. If noodles size is same, the lower the water content, the longer the cooking time. If noodles are of the same water content ratio, the bigger the noodles size, the longer the cooking time. For hot soup noodle, because noodles are cooked while topped and served in hot soup, we have to boil the noodles a bit harder. If you’re cooking cold dish or tsukemen that you need to wash and chill in cold water, you need to cook these types of noodles longer to be softer. 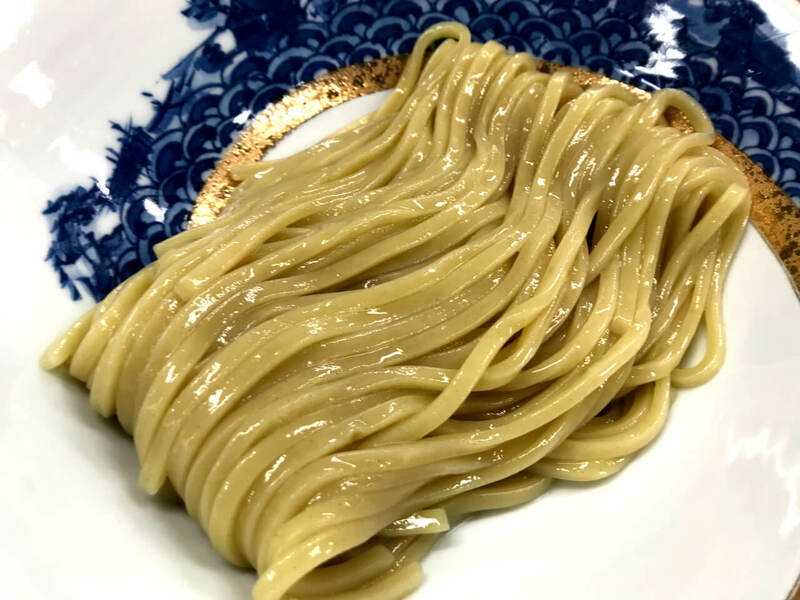 For maze-soba, the type of ramen dish that mixes small amount of soup or sauce with noodles, if you cook and serve noodles as they are, it would be poor texture with slimy starch on them. You should cook noodles and wash starch off the noodles first. For cold dish, you can serve them as they are, but for warm dish, you need to reheat the noodles before serving them. So, for warm maze-soba dish, you should consider cooking time with reheating the noodles in mind. Again, cooking of noodles is critical in that it makes your delicious noodles bad if done in wrong ways. So, please keep these tips in mind when cooking your noodles next time. With all these knowledges you learned from these articles, you should now be able to serve very good ramen noodles. With proper information and techniques, you can be a noodle master. Please feel free to contact me for any questions about what’s discussed in this article or anything else.